Bring your class to the Ohio Shakespeare Festival at Greystone Hall in downtown Akron for a 60 minute production of Macbeth or Romeo & Juliet...or bring us right to your classroom. This production for students features beautiful costumes, sets, and three main stage OSF actors telling a concise and complete version of Shakespeare's story, using the Bard's words and his best theatrical techniques. No added concepts or gimmicks--this is Shakespeare's story in its purest sense. Bring us to you school for as little as $300. OSF is committed to working with your school's schedule and budget. "Our students were captivated by their talent and inspired by their enthusiasm...several students asked me when the company could return to Lakeland, explaining that their passion and skill allowed Shakespeare to come “alive” for them for the first time...I share in OSF’s excitement to show students how relevant and compelling Shakespeare’s works are today, and I am grateful that the Lakeland community had the opportunity to interact with such a dedicated group of professionals." 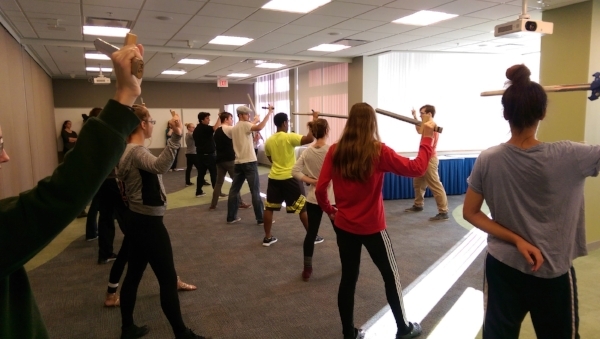 "The students haven't stopped talking about their experiences...our director also could not stop talking about what a boost it gave the performers...[she] noticed at our Friday afternoon rehearsal students using the [stage combat] techniques both Joe and Ryan taught them." "Shakespeare was a freaking GENIUS." "The movement class was intriguing, and I enjoyed experimenting with transferring tension tangibly between characters. In the combat class, the instructor was effective and hilarious, and I enjoyed seeing how relatively easy he made it for myself and the rest of the class to get a grasp on the exciting skills. In the prose class, seeing how much instruction is hidden in Shakespeare's works was terribly thrilling. The concepts of using differing pentameters and predominance of vowels or consonants to give hints to actors will likely remain with me for quite some time. The play was masterfully done. I was stunned by the speed and clarity of their character changes, and I applaud their goal (which I think they accomplished that day) to make Shakespeare accessible and exciting." "Today, my seniors experienced Shakespeare the way it's meant to be studied: seen. Thank you Ohio Shakespeare Festival educators, directors, and actors Tess Burgler and Joe Pine for having a BLAST with my students. These are the moments I cherish as a teacher." "Ohio Shakespeare Festival’s generosity to Hudson Montessori School has been invaluable. So many young people have been impressed by good theatre ... What a pleasure to introduce young teenagers to extraordinary talent and authentic theatre experiences!" Would you print out and read the screenplay from your favorite movie? No. So why do we study Shakespeare's scripts as if they were novels? If we don’t want students to lose interest in great works of art, why read what’s meant to be seen? SUIT THE ACTION TO THE WORD. As a dramatic poet, William Shakespeare originally produced and acted out his work; it was his friends and colleagues who later translated those plays into literature. He never intended it to be written for the elite high society to read. His main goal was to entertain even the lowest classes with his exciting and accessible theatre. What better way to inspire students than to let them experience his work through professional, theatrical performances of his plays--the way Shakespeare intended them to be.